Ultimate High Definition Audio Visual Performance! 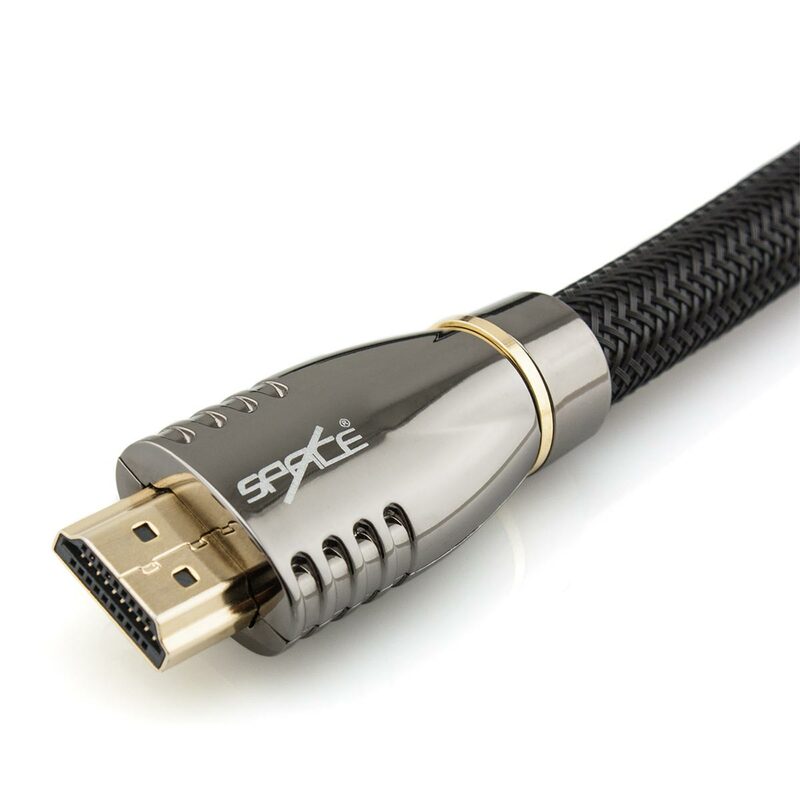 This Space Saturn Series™ High Speed HDMI Cable with Ethernet has been designed and developed with precision workmanship and stringent quality control to provide you with unparalleled performance. The triple layer shielding will effectively eliminate and reject electromagnetic interference (EMI) and radio frequency interference (RFI). The twisted pair Oxygen Free Copper (OFC) conductors also work in synergy to cancel out EMI and to prevent crosstalk, which results in a HDMI Cable that delivers flawless, crystal clear video and audio. This cable utilises a nitrogen injected dielectric. This means nitrogen gas is injected into the dielectric to maintain a perfectly balanced impedance. This is yet another step to ensure that an optimal quality signal is delivered. To add the final touch, this cable features a triple weave outer braid. This improves durability and adds another layer layer of protection. 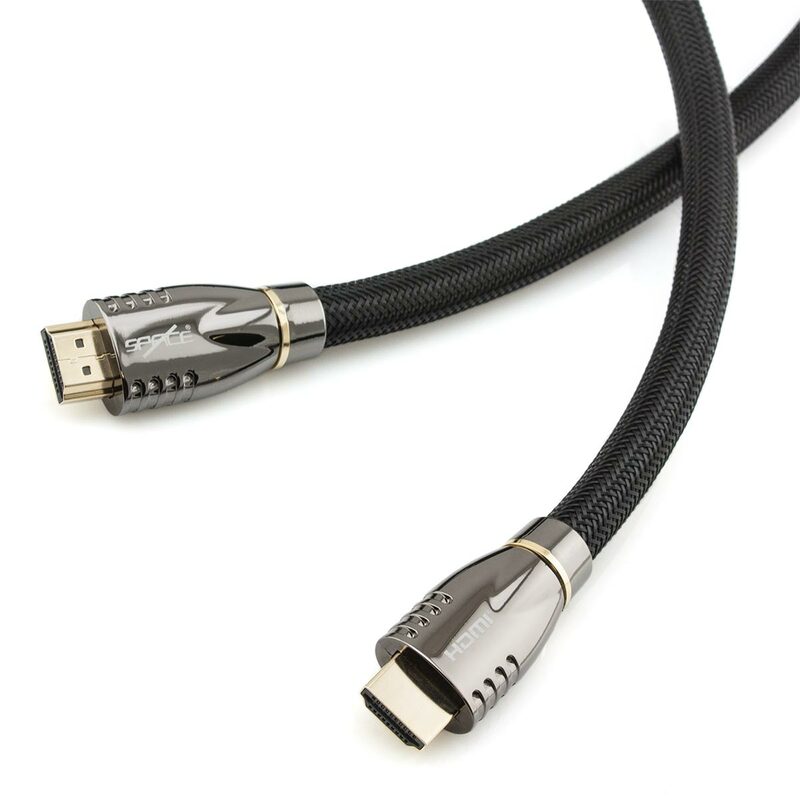 This cable is also encased with a chromium plated zinc alloy plug housing. This looks absolutely superb with its pearlescent allure and serves to facilitate an extreme level of durability. The 24k gold plated connectors will also ensure the best possible connection at all times. 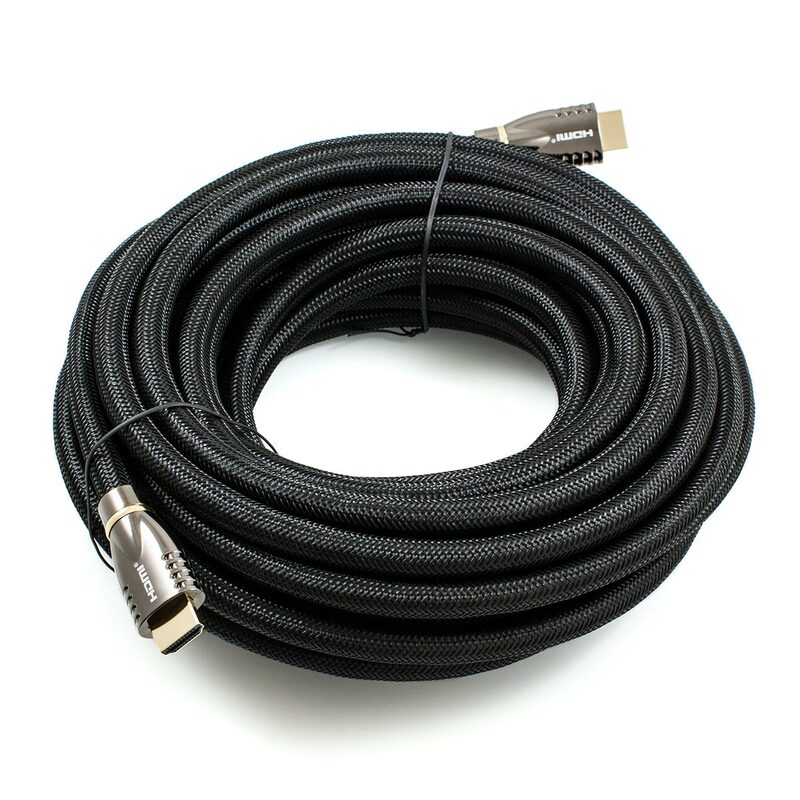 All of these features combine to ensure that this cable provides you with a stunning audio visual experience, to be extremely durable and to offer an attractive aesthetic appearance that supersedes HDMI Cables many times the price. Purchased this for use with an Nvidia RTX 2080 and a Sony Bravia KD55X8500C and it has worked flawlessly at FHD, 2K and 4K 60Hz with HDR. Surfing the Net, I am so glad I came across Space Hi-Fi. B - For the very comprehensive technical information supplied on their website for goods in their catalogue, which makes one more confident in choosing the right product. I learnt a lot! C - For not being confronted with unnecessary multiple choices which can be so confusing. D - For the the quality of both items received at reasonable prices. Excellent value for money. E - For the courteous attention received. I bought what I thought was a decent quality HDMI cable from Officeworks for my media center to projector however it couldn't handle any higher resolution videos - lots of black outs in the video stream. Tried a passive inline HDMI booster but that didn't help either. After a bit of research I came across these cables - I was skeptical that one HDMI cable would be that different to the next but after installing one of these suckers I haven't had a failed video yet. Great stuff! Recently purchased new Yamaha Blu ray and Receiver, needed better than average HDMI cables, but didn't need to spend stupid money on a "name cable". I bought Saturn Series 0.5m and 1.5m lengths, work just as well as the super expensive cables. Thanks for the speedy delivery by the way. Regards, Paul. Aside from the great quality Saturn cables, easy website transacting & super slick delivery to me at Tamborine Mountain, the customer service & follow up attention received through the process to tackle technical queries that I had with adaptors was excellent. In this case they have to be returned for credit which was recommended by David at Space Hi-Fi without blinking an eyelid. An overall outstanding experience, thoroughly recommend Space Hi-Fi as a supplier & their products. 1080p that the lower versions deliver. Your Blu rays and DVD's will never look better. With the launch of the Samsung UBD-K8500 and it's love of pushing out 60Hz 10 and 12 bit 4K video at 4:4:4 for the menu screens, I was a bit worried that it was going to be pushing the limits of the HDMI cables. I shouldn't have worried. No problems whatsoever! Highly recommended if you're making the jump to Ultra HD Blu Ray. I have been using Space HiFi for my home theatre connection needs for many years now. With the advent of the new 2.0a spec & HDCP 2.2 you need not worry with these HDMI cables from Space HiFi. I connected my new Samsung UBD-K8500 4K UHD Blu-ray player to my SUHD TV & used my existing Saturn Series cables. Everything worked seamlessly & the era of 4K Blu-Ray quality is there for all to see. David from Space HiFi is always a pleasure to deal with, prices are fantastic for such a quality product. I use express post & receive it the very next day in Adelaide. 5 star product from a 5 star Australian company! My one and only store for HDMI cables, quality for price can't be beat! Thanks guys. A quality cable with fast delivery. Will buy more. Bought this for my new Ultra HD TV and Blu-ray player. Fantastic reception, far greater than my previous 1.4 cable. I have now submitted 4 orders with Space Hi-Fi. Every one has arrived in Hobart within 4 business days and has been correct, and the quality of the items has been excellent. I need to run a 10m HDMI cable to my projector and the image quality is excellent, plus the cables look great. I like the information that you can peruse before ordering as well. Thanks Space Hi-Fi. Great quality cables, never had any problems. Highly recommended. After buying the Saturn Series HDMI cable the picture from my Toppy to the large screen LCD TV has improved beyond belief. I have never seen such a rich and vivid picture before and I am extremely happy. I am in the process of changing all HDMI cables to the Saturn Series. Thank you again and it was worth every cent. A big thank you! The HDMI cable (20m) is of the highest quality (Saturn Series). Delighted! The price, brillant. Excellent value for money! The service from Space Hi-Fi, could not ask for better! I would recommend Space Hi-Fi to all my friends. Also, fast delivery!